Winchester Niitete Boye was born in a great music families(Amoo,Boye and Addy families)ad he was brought up in a strict Amoo`s family. He started playing the drums at the age of the age of 8 years. 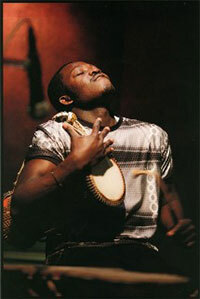 His uncle David Nii Amoo was the head of the Dance company of ghana(Ghana Dance Ensemble).David likes when ever he sees Niitete trying to play the drum and he anticipated the future of Niitete`s drumming.So david start to teach Niitete how to play the drum well and some Ghanaian traditional rhythm. Winchester Niitete Boye developed his drumming skill at unexpected rate and that make david desired a higher level from Niitete and called order traditional master drummers to teach Niitete more of the traditional musics. At the age of 16,Niitete had mastered the traditional music and started playing with his teachers,which surprised them and others. He joined the National Dance Company where his uncles also plays,then played with them for five years for national and international tours. Winchester Niitete Boye is not only good at his traditional music but adopts to various style of music,like JAZZ, BLUES, ROCK, REGGEA, FUNK etc.. and his really good and strong at improvisation. He has been playing with musician with strong personalities and comes out with new charms every time whenever he perform. Niitete plays six to ten percussion drum at the same time with a fast hand moving on it.He plays,CONGA, DJEMBE, KPANLOGO, TALKING DRUM, BELL RHYTHM, CAJON, TIMBALES and other percussion staffs.